Now that Kitelife has gone bi-monthly, I will try to include profiles on more than one kitemaker in each edition. In which case, there are separate articles for each kitemaker. 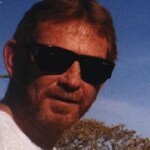 Last month I introduced you to Neil Taylor from Western Australia ….. I follow that up in this issue with an interview from a husband and wife team also from Perth, Western Australia. They are Ray and Gail Wilmer. 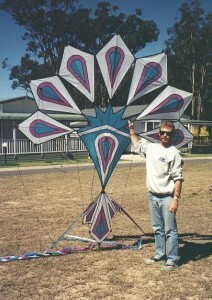 Ray won best kite award at the 1996 Festival of the Winds in Sydney, Australia and his wife placed third in the same year. Between them, they have won numerous awards for their kitemaking skills, producing high quality kites, with some unique and orignal designs. So push on and enjoy reading about Ray and Gail and their kiting exploits. 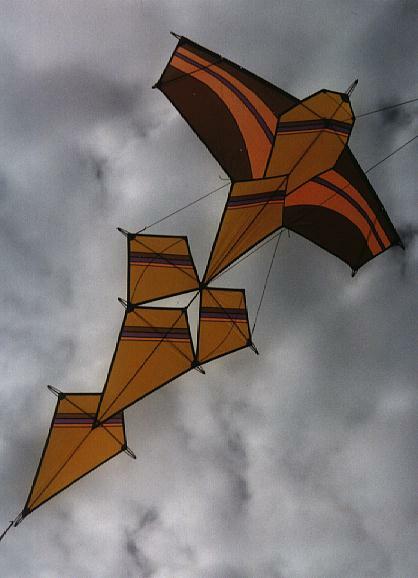 Kitemakers : Ray and Gail Wilmer. Tell me a little bit about your background please Ray. Gail and I were both born in Wellington, New Zealand and moved to Perth in 1988. We have 3 children and 6 grandchildren who seem to keep us busy in between kiting. Ray has worked in the Liquor industry for over 30 years, and at present is involved in a liquor store in Perth. Gail has a banking career and works for the state bank Bankwest. Tell me about your involvement with kite clubs. We both have been involved with our local club (Kitewest) for about 4 years now, with Gail holding the position of Secretary. KiteWest meet at a different location around Perth every Sunday. 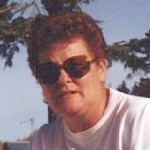 Gail is also on the Committee of the Australian Kiteflyers Society (AKS) (http://www.aks.org.au) in Sydney. How did you get into kites? My son came home to visit, put a sport kite into my hands This was a flexifoil kite back in 1993, and from that point I was hooked. I only flew sport kites for about a year and found I got bored with just flying around in circles, and I felt I could be a bit creative with building single line kites. In 1994 I attended the Festival of the Winds in Sydney, and looking at the array of kites decided that I could also make these. Gail was never really interested in sport kites, but again, the chance to be creative caused her to take the old adage, “If you can’t beat them, then join them”. It has now become a race for the sewing machine in our house. What style of kites do you make? My aim is to build kites that are different in shape to the “norm”. Gail on the other hand prefers a more traditional shape, then spends weeks on intricate appliqué work. She has a lot more patience than me. What can you tell about your construction techniques and/or the equipment you use? As we both have “normal” jobs, our kites are made purely as a hobby. We use a simple domestic machine, an old Husquvana which luckily has a triple-stitch zig-zag, which is the stitch I always use. We usually use the kitchen table for as the cutting table. The fabric pieces are hot-tacked together before sewing, but we are about to experiment with spray adhesive. With a well-stocked outlet in Perth, (Hold the Line Kites), and Neil Taylor being a friend, all the materials are purchased locally. Carrington k42 fabric is used as I like the way it shines and the fact that it does not crease easily. Rods are carbon fibre and parts are of the type found in any good kite shop. How do you arrive at your new unique designs? I start with a simple shape (say a diamond) on a piece of paper. Over a period of weeks I modify and add to it until I come up with a design that I like. Unlike most makers, I never have a “drawn to scale” plan, nor do I make templates unless there is more than one piece of the same size. Once the skin is finished I decide on where the spars should go and the pockets etc. The bridles are purely “trial and error” when the kite is finished. Most of the drawings never quite look like the finished article as I constantly change things as I go. The may seem foreign to most, but I prefer it this way as it makes the kites unique and definitely a “one off”. Who has had the most influence on you in your kite making? Where is your favourite flying site? No one place stands out, but we both have a soft spot for our local beaches where most of the time the winds are steady. The climate in Perth is such that flying is possible throughout the whole year. 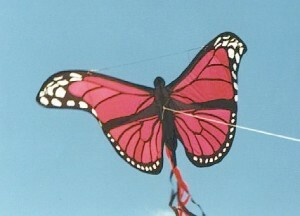 As we do not sell our kites it is starting to get difficult to decide which kites to take with us on a fly. What aspirations do you have involving kites? While we have been fortunate in being able to attend festivals in Australia, New Zealand and Asia, over the next few years we hope to be able to attend major festivals in America and Europe. Why do you make and fly kites? We have made many new friends through kiting, and one of the things that has stood out is the willingness by other flyers to impart their knowledge to others. Kitefliers are kitefliers, with no regard to social standings. I like that. 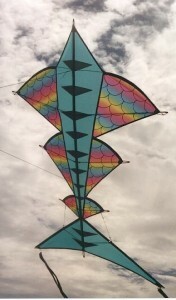 Which is your favorite kite, of the ones you have made? My favorite kite would have to be the Peacock Tail. This is the second of two, I was not happy with the first so made a number of changes. It is also special as it won us two overseas trips at the Festival of the Winds festival at Bondi Beach, Sydney in September 1996. What is the silliest thing you have done? We both climbed a volcano in Bali to fly a kite from the top. This was following the Bali Festival in 1996. David Bull, Neil Taylor, Gail and myself all were there. An awesome view although we were the only ones to be able to appreciate the kites. Silly – but the view was worth it. 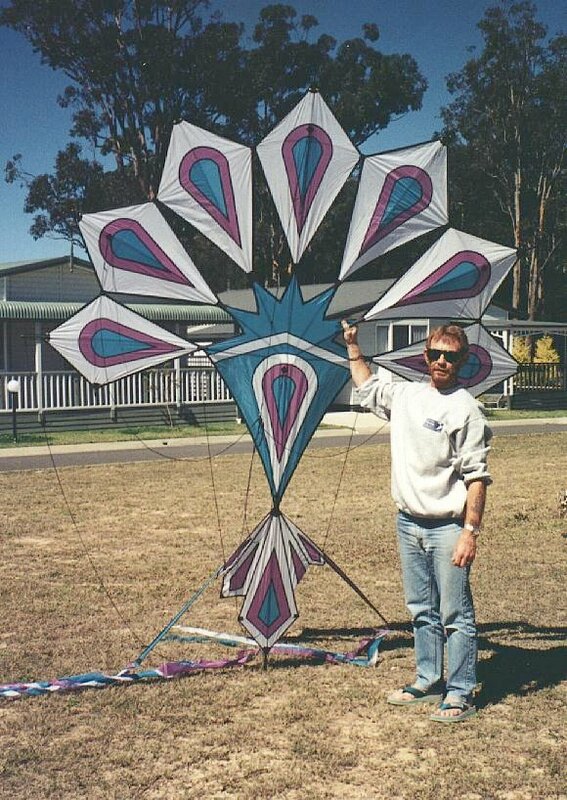 This entry was posted in 1998, Issue 5 (Sep/Oct), KL Archive and tagged Australia, kitebuilding, kitemaker.